And a big thank you to all the bloggers out there who have made this giveaway a success! You guys are great! Is there anything quite so wonderful as a hot cup of coffee? For coffee lovers and coffeeholics, it is a little piece of heaven here on earth. So, how about getting 4 bags of organic coffee beans, for free?! You could win them in this giveaway sponsored by Rogers Family Company! To top it off, Alicia over at MasterofMom.com is throwing in a Krups Fast Touch Grinder to help the winner get those beans ground to the perfect consistency. You can check out what she had to say about the organic coffees she received from Rogers by reading her reviews here. 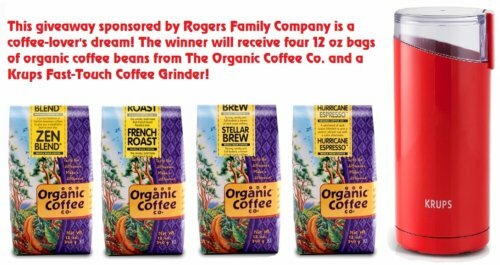 Rogers Family Company has been making coffee since 1979 and they are a 100% family-run company that’s committed to sustainability through their Community Aid Program. You can connect with them through the giveaway below, or by visiting their website here. Disclosure: I received no compensation for this publication. My opinions are my own and may differ from those of your own. Mum Eats is not responsible for sponsor prize shipment. If you have questions regarding this giveaway, or if you would like to see your business featured in a giveaway like this one, please email masterofmom@gmail.com! This entry was posted in announcement and tagged giveaways on 22.June.2013 by admin.